I know that many women want to be able to do proper full push ups, not girly ones. All the women I train want to get good at push ups. To get perfect push ups, it is important to practise the correct body position right from the start. This is why doing push ups on your knees isn’t very effective when it comes to progressing from knees to full push ups. The body position isn’t the same. When you have mastered these push ups drills, you can practise full push ups by raising your hands to a bench or a high bar. This post on how to get perfect push ups shows you how. 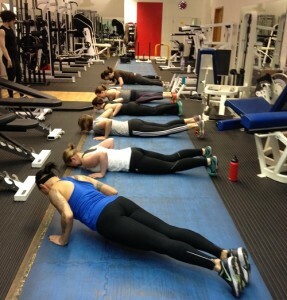 Here are the women of our Ladies Who Lift beginners class learning how to do push ups using the drills in this video. This video is part of our five-part video training series Strength Made Simple: how to lift weights with perfect technique in just 5 days. To get free access to the full series, just enter your details on the homepage.